The obverse (front) of the Mexican 50 Pesos features a striking portrait of Winged Victory standing in front of the Mexican volcanoes Iztacc'huatl and Popocat'ptl. This coin is often compared to America's most beautiful coin, the $20 Saint-Gaudens. The obverse also lists the face value ('50 PESOS'),the gold content, and the date of issue opposite the date of Mexican Independence,1821. As a side note, coins dated 1943 only have a variation of this design. The gold content ('37.5 Gr. ORO PURO') appears on both sides of Victory. The reverse (back) features an eagle and snake design surrounded by the words 'ESTADOS UNIDOS MEXICANOS,' which translate to United Mexican States. 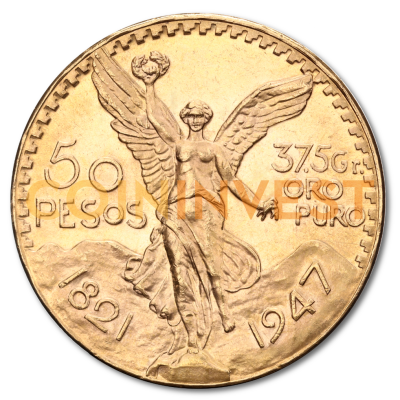 Interestingly, the 50 Pesos, 10 Pesos, and 5 Pesos gold coins all feature the eagle facing forward, an antiquated version of the coat of arms developed in the French Style in the late 1800's. Mexican 50 Pesos gold coins are often referred to as Centenarios. Their first year of issue was 1921 to celebrate Mexico's 100th anniversary of independence in 1821. From 1949 - 1972, nearly four million coins were re-struck, most likely with the date 1947.